SSC CGL 2016 RTI information – Latest RTI Reply regarding Normalization, Exam Result, Total Vacancy, Total Candidates, Tier 2 Exam date & CHSL Vacancy: Since couple of days after completion of SSC CGL Tier 1 Exam, I am getting many queries which even SSC hasn’t shared publicly. Luckily, someone has filled RTI to Staff Selection Commission (SSC) to ask all these questions regarding on Normalization of Marks, Exam Result, Total Vacancy, Total Candidates, Tier 2 Exam date, CHSL Vacancy. How many candidates appeared in SSC CGL Tier I, When Tier 2 Exam will be held? When Result will be declared? When SSC CHSL Notification is coming and if vacancy under SSC CGL increase? These are the questions to which the Staff Selection Commission (SSC) has responded. As many as 1425234 candidates appeared SSC CGL (Tier – 1) online examination. SSC CGL Tier 2 will be held in November. 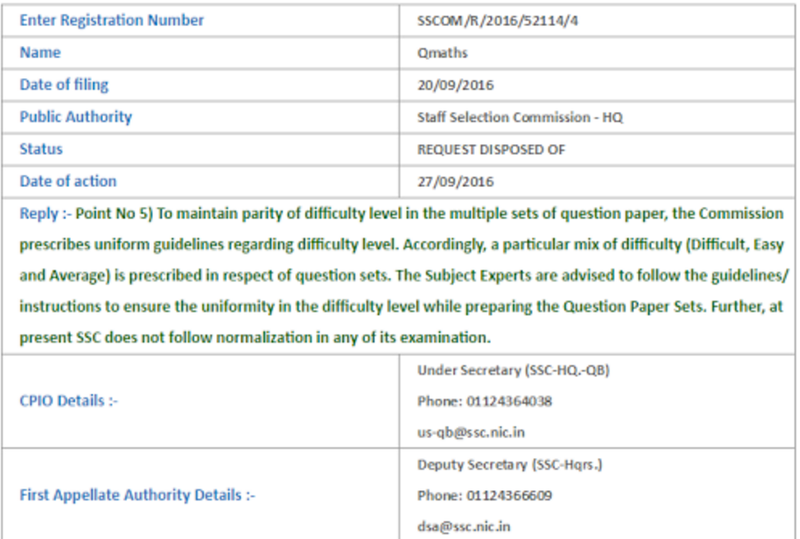 SSC CGL Tier 1 Result to be out in first week of October 2016. SSC CHSL 2016 Notification 08-10-2016 (Expected). No Normalization in SSC CGL Tier 1. 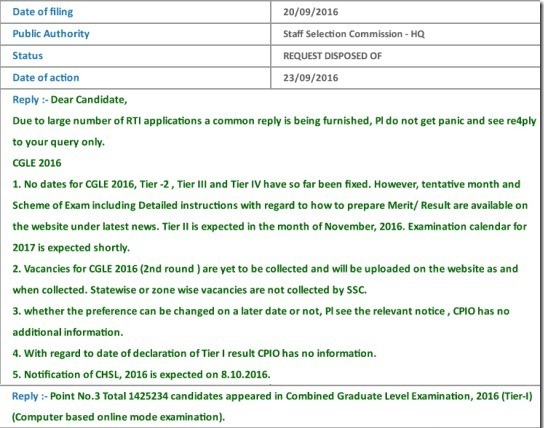 Here are some hidden points of SSC CGL 2016 which revealed through latest RTI replay. Check out the answer below. 1. No dates for CGLE 2016, Tier 2, Tier III and Tier IV have so far been fixed. However, tentative month and Scheme of Exam including detailed instructions with regard to how to prepare Merit/ Result are available on the website under latest news. Tier II is expected in the month of November, 2016. Examination calendar for 2017 is expected shortly. 2. How many Vacancies in SSC CGL 2016 (2nd round ) are yet to be collected and will be uploaded on the website as and when collected. State wise or zone wise vacancies are not collected by SSC. 3. Whether the preference can be changed on a later date or not, Pl see the relevant notice, CPIO has no additional information. 5. Notification of CHSL, 2016 is expected on 8.10.2016. Look at the picture below for proof. 7. To maintain parity of difficulty level in the multiple sets of question paper, the Commission prescribes uniform guidelines regarding difficulty level. Accordingly, a particular mix of difficulty (Difficult, Easy and Average) is prescribed in respect of question sets. The Subject Experts are advised to follow the guidelines/ instructions to ensure the uniformity in the difficulty level while preparing the Question Paper Sets. Further, at present SSC does not follow normalization in any of its examination. SSC CGL 2016 Expected Cutoff Marks. SSC CGL Tier 2 Exam Date.